Let Me Live: "Among these are Life..."
This Independence Day we celebrate a declaration, not only of the independence of 13 colonies, but also of some timeless truths that our Founding Fathers recognized: "We hold these truths to be self-evident, that all men are created equal, that they are endowed by their Creator with certain unalienable Rights, that among these are Life, Liberty and the pursuit of Happiness." When Congress or the Supreme Court or anyone else tells us what rights we have or don't have, let us never forget that it is God Himself that has given rights to all men, based on the fact that He created them in His own image. Human rights come from God, not from government. Our Founding Fathers knew that, and we must not forget it. The rights to life, liberty, and property are all under assault, but the chief among these is the right to life--a right which our laws fail to protect before birth (and in some cases after an injury or debilitating disease). There are many fronts in the battle for God's gift of life. Some battle the forces of death in the legislatures. Some in the courts. Some in the battle for the hearts and minds of Americans. Some educate young people about the dangers of immorality and urge them to abstain until marriage. Others volunteer at pregnancy helping centers, persuading women not to abort. Still others stand as a last line of defense at the abortion clinics themselves, either protesting or doing sidewalk counseling. With so many different fronts, there are many gaps in which to stand. Our Founding Fathers pledged their lives, their fortunes, and their sacred honor to defend the freedoms they held dear. As we honor all the patriots who have risked and given their lives in defense of our freedom, let us commit to defend the God-given right to life with equal resolve--and with equal reliance upon the Author of life and the Giver of liberty. Wesley Wilson is the President of Let Her Live, a nonprofit dedicated to saving babies by showing the beauty and value of life to women considering abortion. 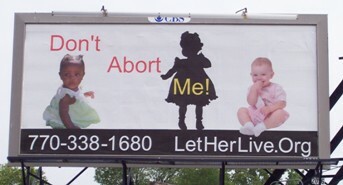 Please learn more about the Let Her Live pro-life billboard campaign. Donations are tax deductible. Let Me Live (formerly Let Her Live) proclaims the beauty and value of life to abortion-vulnerable mothers and fathers through our targeted advertising, as well as through our website. We refer abortion-vulnerable women to qualified pro-life counselors through our advertising and website. We encourage the Church to fulfill its God-given mandate to do justice, love mercy, and walk humbly with God. We invite you to learn more about us or to consider giving financial support. Will God Forgive Me If I Abort? Loving God and Loving our Neighbors -- a Balance?